After a recent holiday this year on the river, I had quite a few photos of my relatives to scrapbook. 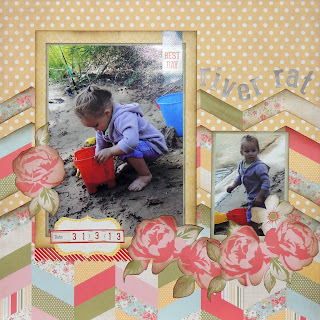 This page features photos of my little niece as she played in the mud at the rivers edge. I chose to use the Polka dot paper as the base of my page then cut out different thicknesses of the chevron design from the chevron patterned paper that I inked the edges of and layered over my background. Next I used some of the patterned papers to mat the photos and layered them onto the page. Using the Floral patterned paper, I cut out all the large rose sections, inked their edges and layered them as seen in the photo. Lastly I added different stickers, layering a few over a label sticker. One extra thing I chose to do once the adhesive was completely dry was to go back and bend the inked edges of the chevrons and the floral sections to add extra dimension to them. Cut Suede Nutmeg paper 6 1/2" x 5". If you want to conserve this paper, cut out the center and save! Cut 5 3/4" x 4 1/2" patterned paper from the Authentique Autumn Paper Collection. Center size is 5 1/2" x 4 1/4". Stamp with Leaf Background stamp and color with colors of your choice, using Tim Holtz Distress Markers. Brush on Gold Ice Stickles for shimmer. Embellishments of your choice, of course! On this card there is ribbon for the bow, butterflies (I love butterflies), metals (Made For You heart) and metal corners. This card was made special for a friend's Mother! We have another new team member on the Frantic Stamper Design Team! 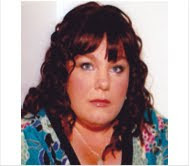 Please welcome Jessica Griffin. 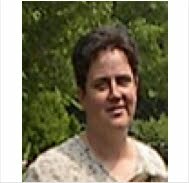 I will let Jessica introduce herself to you. Hi! 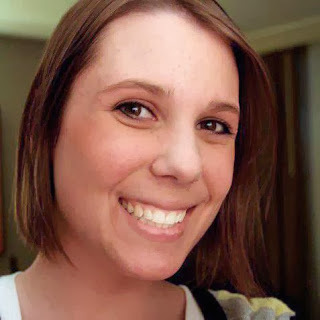 My name is Jessica, I'm known around the paper crafting industry as "canyoupixelthis". I've been crafting for seven years now. My interests have changed as I've become more involved. I love creating mini albums, banners, and doing mixed media projects. 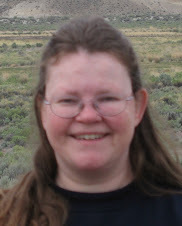 I also enjoy sewing, knitting, teaching, and exploring new crafts! When I'm not crafting, I'm usually with my family, and our sweet Josephine exploring the beautiful places we live! My husband and I have three children, two girls and one boy. Josephine, is our fourth child, a lab/boxer mix, whose curiosity often gets the best of her! I hope to inspire you, and help you use your stash, and encourage a few purchases! I currently design for Lindy's Stamp Gang, Glue Dots, Dreamweaver Stencils and now… FRANTIC STAMPER!! Yay! You can check out my work at my blog, canyoupixelthis.com, and soon here on the FranticStamper blog! Stamp Frantic Stamper's Leaf Background image on white cardstock using Jet Black StazOn ink pad. 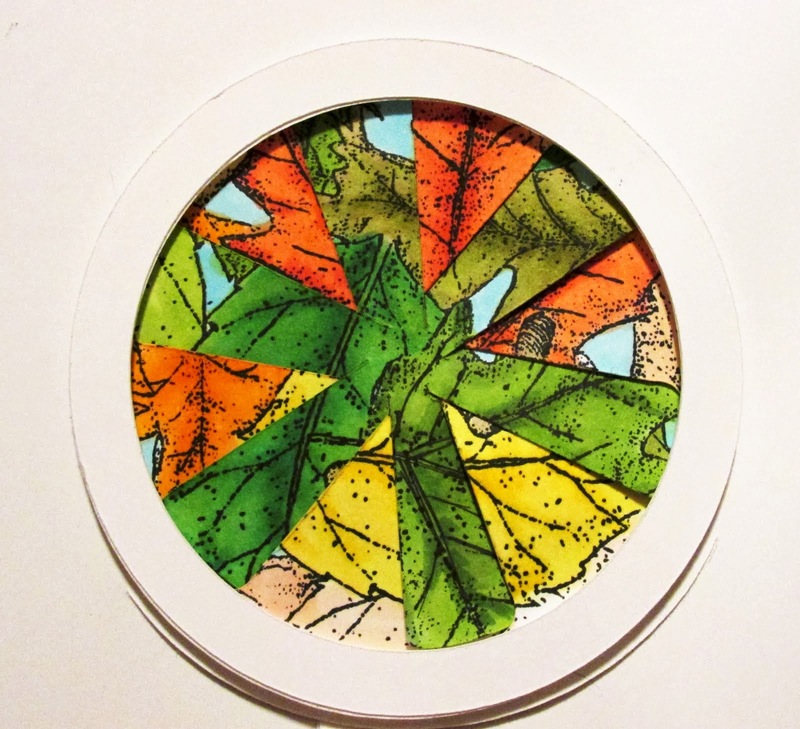 What's fun about this project is you can use your imagination in the coloring of the leaves. 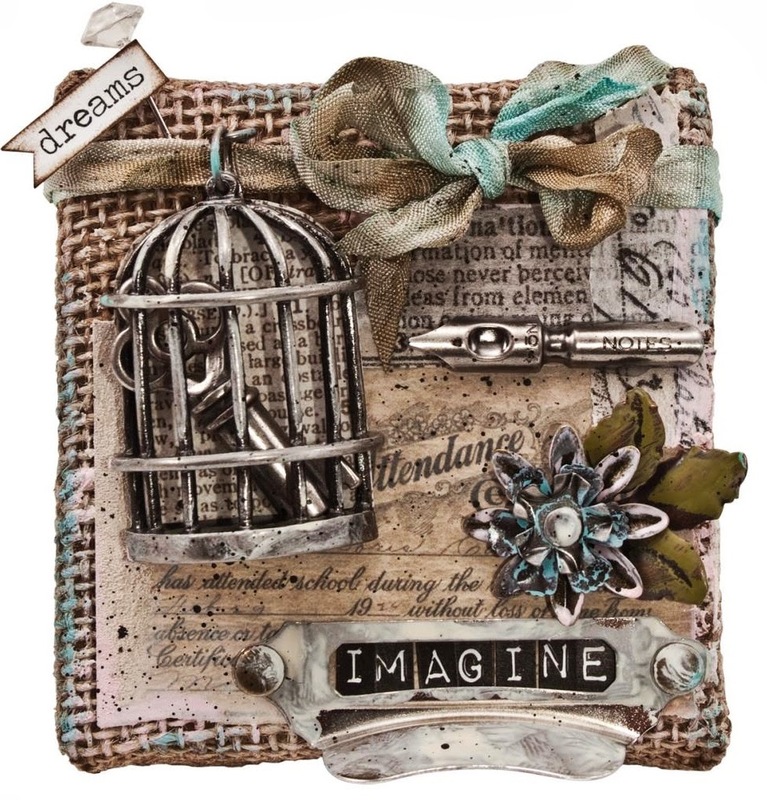 Using Tim Holtz Distress Markers (16 colors) from his Distress Marker pack (linked below) proceed to create to your hearts content. Let the coloring dry and then take a small paintbrush and brush on Stickles Ice Gold (lightly) to give the shimmer effect. Use your imagination to decide how you want to use the colored image! Too much fun! I really wanted to make a Halloween card with the wonderful Frantic Stamper chandelier die so I went to my Halloween paper stash to see what I could use with it, and was blown away when I found I had some of My Mind's Eye "Haunted" Small Chandeliers flocked card-stock! It was PERFECT for my project, don't you think? Adding a border of chandeliers, also from the Haunted collection, some black card-stock, and a Kraft card base made this card in short order! I started my Halloween card with a layer of spooky spider webs in purple on black layered on orange and black. I added a creepy die cut drippy border and some washi tape. Then I created a medallion by die cutting a square scroll out of both white and black card stock and stacking and gluing them together. I trimmed off all of the outside loops of the scroll, and then glued what remained to a scrap of black card stock. When dry, I trimmed it to the shape of my frame. I then die cut 6 small skulls from white and then stacked and glued them together and glued them to the medallion frame. I added my medallion to the center of my card front with some pop-dots. The outside of my card was finished. But what I think makes this card really special isn't the outside. It is the inside! This card is a wonderfully dimensional pop-up card! The most special piece of the card is the graveyard pop-up. I die cut it into of a piece of white card stock that I then colored with Copic markers. The graveyard is a SINGLE die that cuts the grave stones and fence as well the connecting pieces of the pop up , as well as lightly de-bossing fold lines for the pop-up mechanism. There is nothing to do once this is cut except folding on the scored lines and attaching it to another card. Making this intricate pop-up is SO simple! Once the sheet of card-stock was die-cut and colored, I trimmed it and added it o the inside of the card. Here is a closer look at that graveyard. Once my pop-up grave yard was finished, I again used the pop-up die to cut a full piece of black card-stock for my night sky. I trimmed off the die cut piece to remove it from the card and then fit the negative in place. I then trimmed the black card-stock to the size of the top of my card. I then decorated the night sky with a haunted house die-cut and a spooky moon. A couple of ghosts finished the background scene. I then added a very spooky tree I die-cut to the scene by creating a simple box pop-up mechanism. I added glow-in-the-dark glitter on the moon, ghosts, tree's eyes, and haunted house's windows, and then a stamped "Happy Halloween", and the card was done. I hope you have enjoyed my Halloween card and the wonderful dies I used, all available at FranticStamper.com. I love all the design images in the Frantic Stamper Precision dies. I find them easy to use, without having to pick my die-cut out of the die. For this card though, I really wanted to try out something different so I decided to use the negative image rather than the feather die-cut. The feather die is a bit fiddly so I found I had to pre-plan everything for my final image to work effectively. One of the first things I did was leave everything together, the feather in place. I then added a thin layer of adhesive onto the thin pieces that are not connected to the feather and the outer edges. I then turned it over and pressed it down onto my patterned paper. Once dry, I used a toothpick to gently lift out the feather, leaving behind the negative image of the feather. 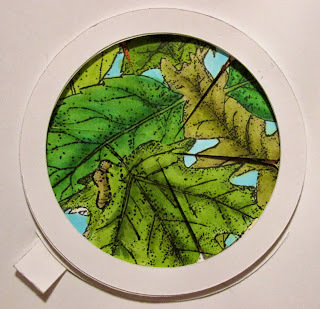 To finish my card, I added a mat to the feather layers and then adhered these to the centre front of my card. Finally, I added a length of twine, knotting it at the base of the feather. 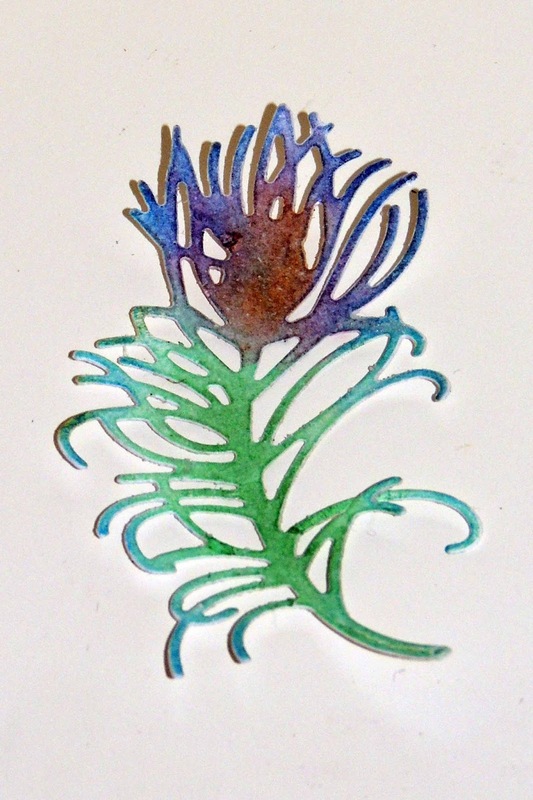 If you decide to have a go at using a negative die-cut image, I'd love to see how it turns out. The new Frantic Stamper Precision Dies are now available. In addition to the dies we shared yeserday, we have a few more in this release that we can show you. First, we have our Mix 'n Match Christmas set of six dies. 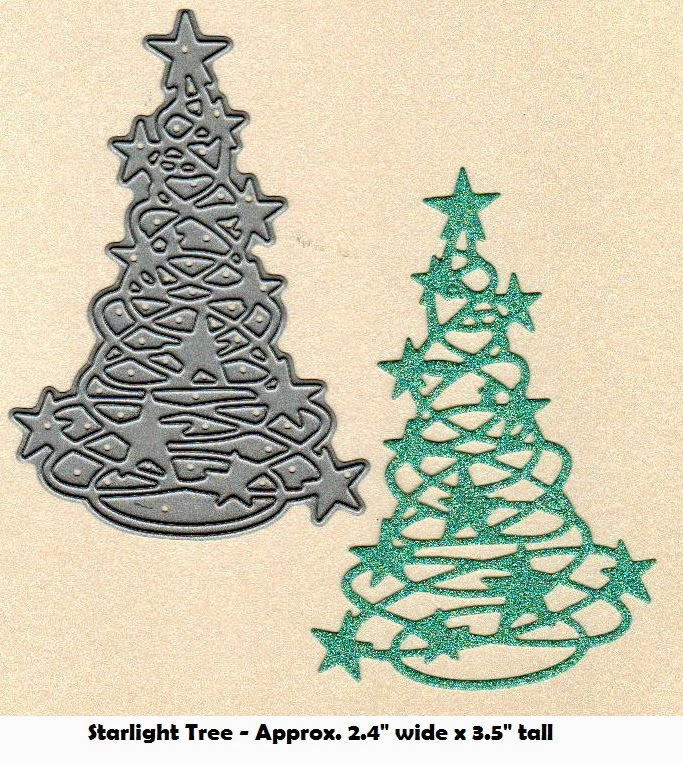 A pair of ornaments that work together (the two dies have cut-out areas in them but those cut-outs do not overlap, so the two dies can work as a perfect backing for each other), a lovely "Merry Christmas", and three of our precision squares make up this set. We hope you'll love them as much as we do! Next is the Little Angel die. Based on a wood-cut pattern, we think this little angel with her cut-out hearts is just lovely in paper, too! 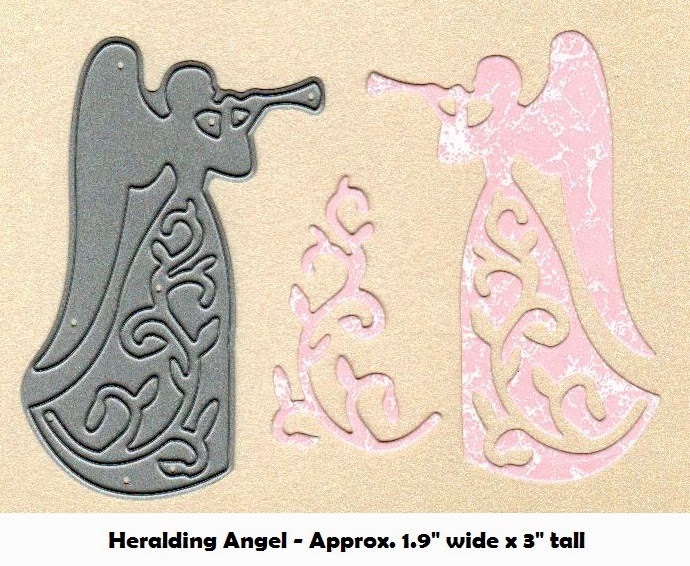 The Heralding Angel trumpeting the holiday is gorgeous by itself, but the cutout from the angel's garments can be used separately, too! It is almost like getting two dies in one! 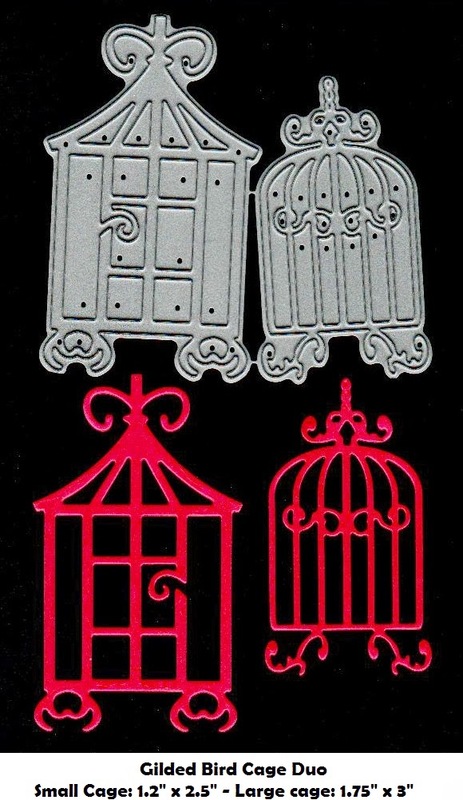 Speaking of two dies, the Gilded BIrd Cage Duo is a set of two dies that cuts two different styles of birdcage. Perhaps they can be paired with some of the small bird dies shared yesterday. Next we have a wonderful repeating edger die that we call the Dazzling Diamond Border die. We just love this repetitive pattern. And lastly, we have the Hollywood Filmstrip die. 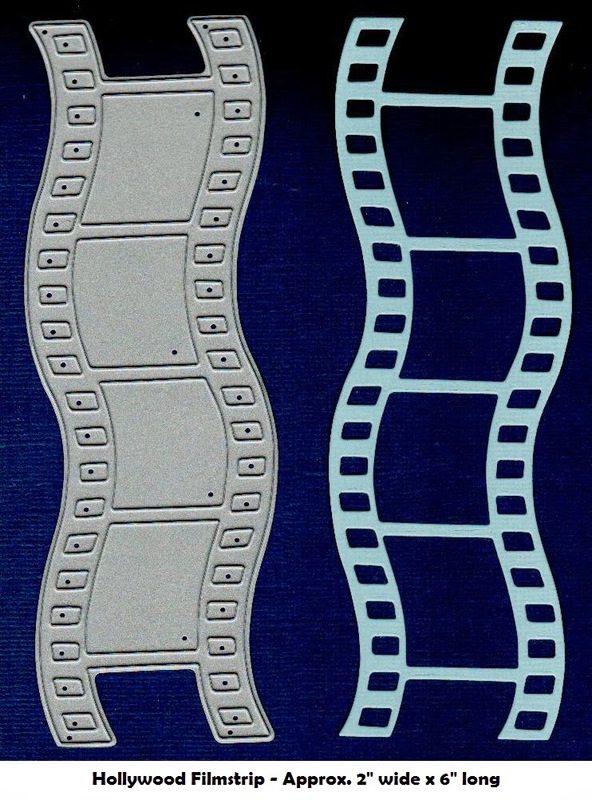 We think this wavy filmstrip would be a perfect way to showcase a series of small photos, or a series of stamped images. It is going to be a favorite, we're sure. 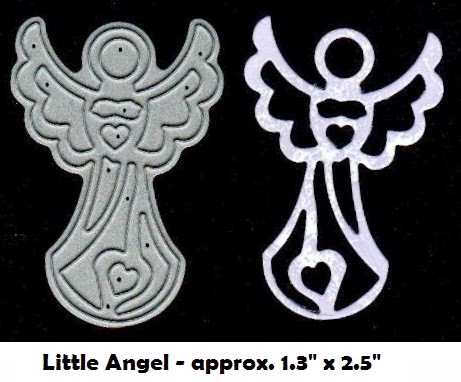 You can find these, and all the dies shared yesterday, on sale now in the newest products at Frantic Stamper. New Frantic Stamper dies to be released soon!! First are the Holly Leaves and Berries dies. 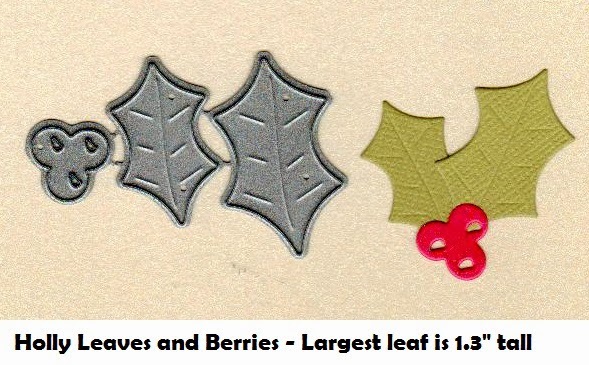 This set of three dies cut two different sizes of holly leaves, and a cluster of three holly berries. I know I am going to love having these for my holiday cards! 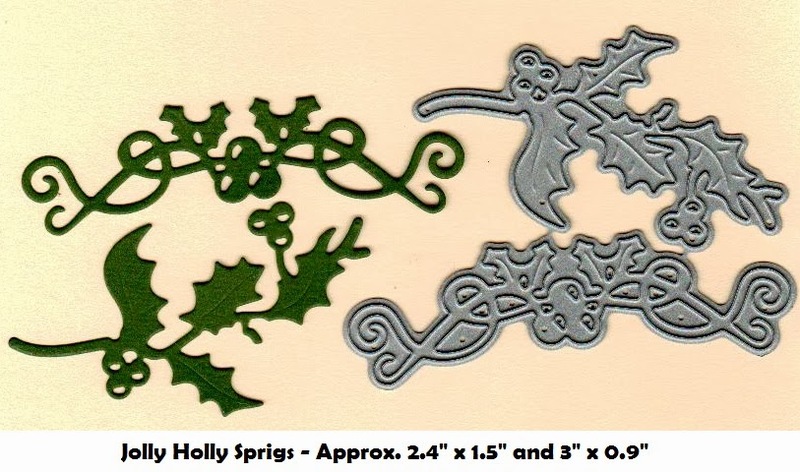 The Jolly Holly Sprigs are sold as a set of two dies that cut two different, but equally gorgeous, holly sprigs with berries. I know my holiday cards really need these! 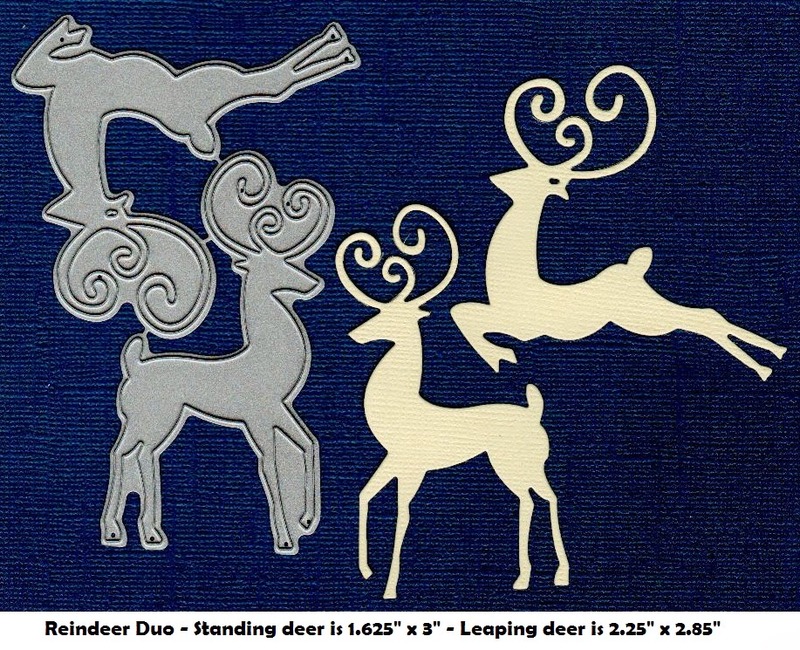 Speaking of holiday cards... wouldn't these two deer be perfect cut from gold metallic paper and adhered to a lovely and luxurious suede paper background in a deep burgandy, navy blue, or forest green? I think I have just designed some of my cards! Up next is a set of five tiny birds. 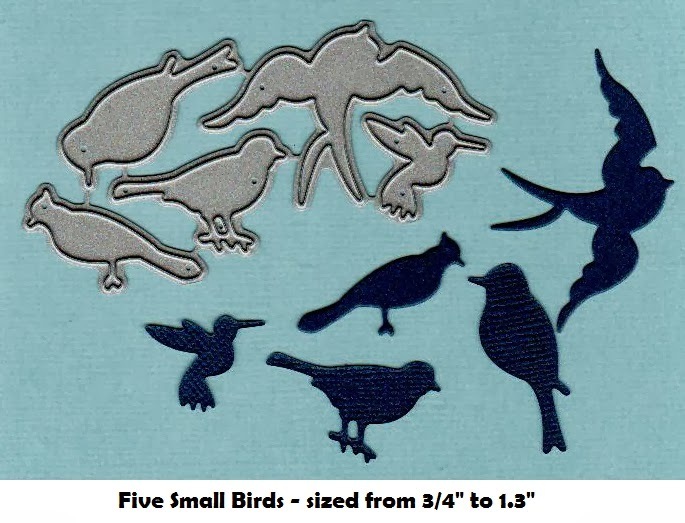 Included is a tiny humming bird measuring in at just 3/4" and a swooping swallow measuring just over 1 1/4". The other birds range between those two in size. I think these will be so much fun to add to all sorts of projects! And now we have the Starlight Tree. This swirly, wispy, whimsical tree is just delightful in this green sparkly paper, but we think it would also be fabulous in metallic gold or silver! We really think a star has been born! 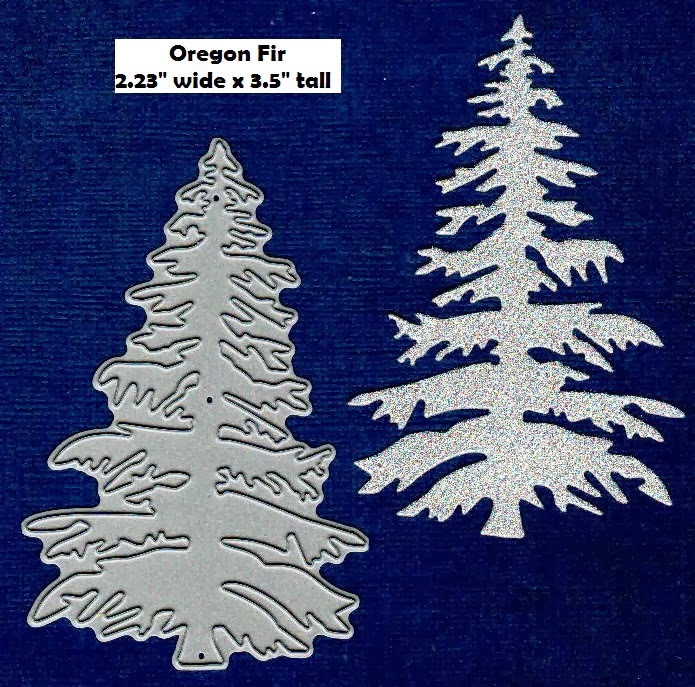 Next up is our wonderful new Oregon Fir die. Measuring a full 3.5" in height, this die will be perfect as a centerpiece for your holiday cards. Isn't a majestic tree cut out in this lovely, sparkly silver paper? 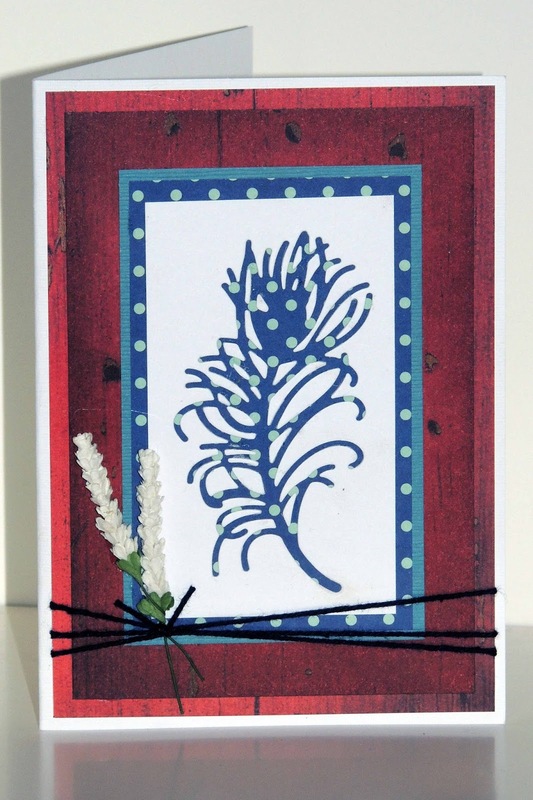 Wouldn't this Enchanted Forest Edger be wonderful for creating a little forest on your card? A full 7" long, it can be used as an edger (the pattern is designed to repeat so you can even use it on you wider papers) or, as with the dark green strip shown below, can be trimmed off to create a separate card element. Love! Lastly, we have our Parisian Lamp Post. This old-fashioned and lovely lamp would be perfect to add a small wreath to for a holiday card, or paired with any of the Frantic Stamper lady stamped images in a lovely Paris-inspired scene. There are even MORE wonderful dies in this release, so check back later todayor tomorrow; I will have more for you as soon as the dies arrive and Fran can get them cut and scanned! I really love elaborate cards that pop-up, flip, or spin. They are my favorite thing to try to make because I love the challenge involved in getting a piece of paper to do things other than just lie flat. But I also love clean and simple cards and quick cards that have visual appeal to make them stand out. This clean and simple card uses a couple of tricks that made a couple of my tools even more versatile, and made this card POP, figuratively. First, the banner was made using the medium flag die from Frantic Stamper's Precision Flag Trio! I die cut the flag from a rainbow of five different papers. The color against the white background gives this card much of its visual appeal. I then stamped the "HAPPY" on the notched end of the flags. I created my banner by putting glue onto the top half of the back side of the flags, and then folding the flags over a small piece of cotton twine. I tied the twine off with little bows, and then I attached the banner to the card using glue dots. That Flag Trio is such a versatile die set! Not only can the flags be used individually as flags, they can stacked to create different flag effects, or folded to create banners! Since it was a clear stamp I was able to simply (and carefully) cut the stamp with scissors. I then stamped the "Birthday" that I wanted, leaving the "Happy" off my stamping block. This trick gives my stamp more versatility. I can stamp the two words individually, or line them up on the block in different layouts, such as stacked, offset, or aligned. I do this with a lot of simple sentiment stamps! I hope you will give these tricks a try. 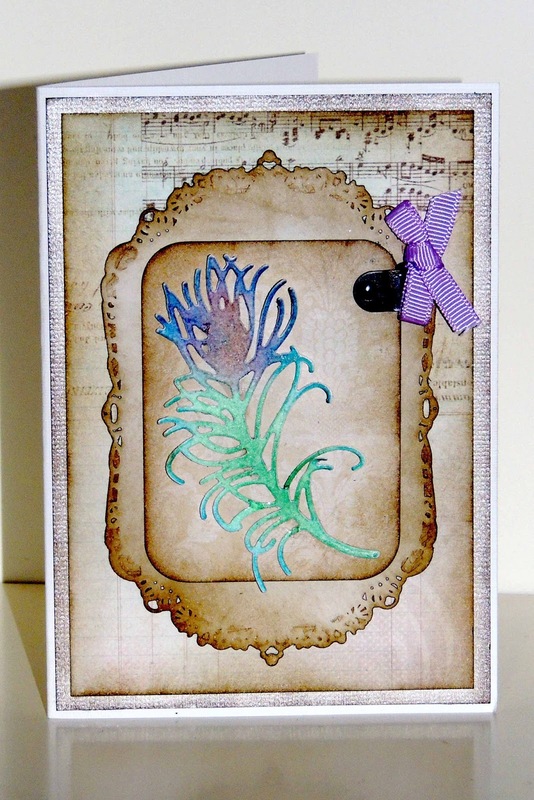 Look at your dies and stamps differently; see what new ways you might find to use them with just a little creativity! Warehouse News - New Products have landed! 1) Tim Holtz & Ranger have just announced 6 new colors of their popular Distress Paints. The colors are: Ripe Persimmon, Scattered Straw, Crushed Olive, Dusty Concord, Pumice Stone and Gathered Twigs. We are currently taking pre-orders. 2) Speaking of Tim, the new Idea-Ology items from Advantus have just arrived. We’re filling all the pre-orders first, and while we may run out of some items quickly, we do have more on the way arriving in the next day or two. Place your order here. 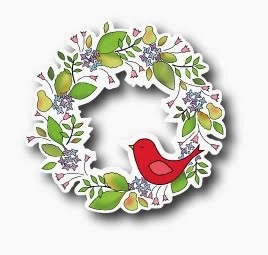 3) Poppystamps has just announced new dies and cling stamps for Christmas. We should have them here on Friday. Pre-order yours today. 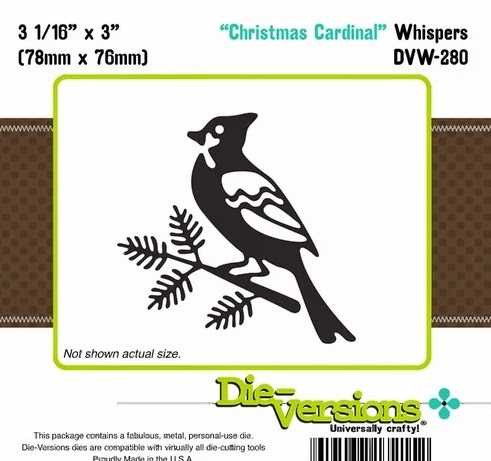 4) Die-Versions also just announced their new Christmas dies. They will be here next week and can be pre-ordered. And that’s not all….. we are expecting more deliveries today, including 2 new Christmas collections from Kaisercraft, Blue Fern Studio chipboard, and new EK Success punches! Watch our new products area for them! The Frantic Stamper Precision dies create just a wonderful array of die cuts that so much can be done with! After die-cutting my feather I used different coloured Chalk pastels that I applied with my finger to gain the coloring that I wanted. I found that the best way was to choose a lighter shade and apply it over the whole section then I used a darker shade that I applied along the centre section to give dimension. One thing that I always find challenging when using pastels is how to set them but this time around I chose to use the Distress Rock Candy, also applied with my finger in dabbing motions. Since my childhood I have been fascinated by pop-up books. I just love the way they tell their stories with dimension and action. Whether it is a pull-up flap, a pop-up design, or a moving feature, it has never failed to captivate me. To me, one of the most intriguing elements I'd ever encountered was the dissolving or changing image books of Ernest Nister. He used sliding and rotating mechanisms to make one drawing seem to magically transform into another. Before now, though I understood his mechanism for the rotating dissolve, I had not been able to achieve it. My craft knife skills were far too poor to be able to replicate the precision needed to have a smoothly working piece. But now I have a Silhouette Cameo. I drew the mechanism in the Sihouette Studio software and created a cut file that I am willing to share with you for a limited time. You must have a DropBox account to access the file, but you can create one for free. Remember, this file is going to be available only for a limited time. Get it before Christmas 2013! First, I cut the cut file on white card-stock using my Cameo and removed the three pieces from the cut mat. I set the ring aside for later. To avoid this, I placed the square mechanism down on the table. I noted which direction the slots in the mechanism open (clockwise or counterclockwise). Next I placed the circular mechanism down so that the slots opened in the OPPOSITE direction. 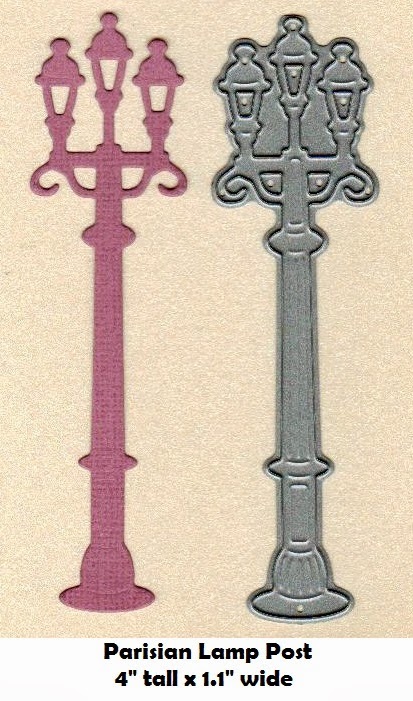 Now I was sure the mechanism would have the correct sides stamped and colored. I created a mask by using a Spellbinders Nestabilities Circle die (matched to the size of my mechanism) to cut a large circle in a piece of scrap paper. (After having to do this, I decided to add a mask to the cut file!) I placed the mask over the mechanism and stamped the Frantic Stamper Leaf Background stamp with Memento Tuxedo Black ink. I colored the square mechanism with autumn colors and the round mechanism with summer colors of Copic Ciao markers. Now comes the tricky part; assembly. I folded the tab of the round mechanism back at the perforation. I placed a small amount of glue at the end to keep the tab folded, but that step is not completely necessary; the card will work fine without it. Next I positioned the round mechanism behind the square mechanism and inserted the sliding tab through the rounded slot of the square mechanism, being sure the two stop-tabs to either side of it stayed out of the slot. With the square mechanism facing me, I positioned the sliding tab all the way to the right of the rounded slot. Once all of the tabs were passed to the back of the round mechanism, the center of the mechanism had a small "flower" shaped part of the round mechanism showing through to the front. I gIently slid the mechanism's sliding tab all the way to the left. It was easiest to do this with the mechanism flat on a table! Next I turned the mechanism over and applied glue to the top and top-portion of the sides of the mechanism, and glue dots to its lower corners, and attached it to a card. It was finally time to decorate the card itself. 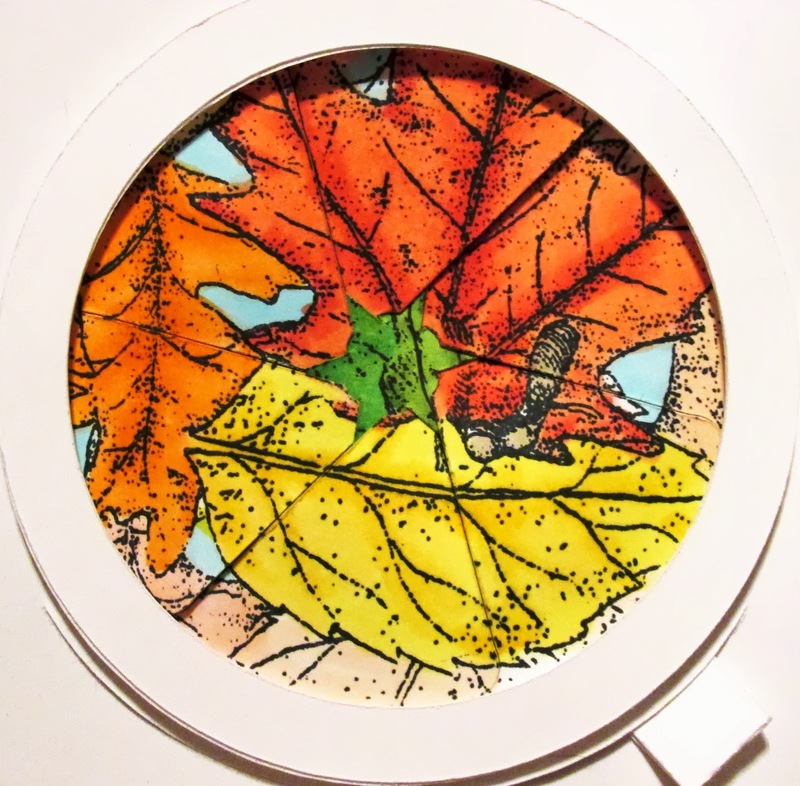 I cut a very large circle using the largest of my Nestabilities dies, from the Small circle die set) in a piece of patterned paper. I glued that paper in place on my card, centering the circle over my mechanism, and then trimmed the paper to fit the card. Next, I cut a ring from a coordinating piece of patterned paper (from the Bo Bunny Autumn Song collection 6"x6" paper pack) using the largest of the Nestabilities dies from the Large circle die set and a circle that was just a little larger than the inside of the ring in the Silhouette cut file. I attached the patterned ring to the plain ring with glue. I finished the card off with a metalic leaf cut with a Spellbinder's leaf die and a die-cut "Congrats"
Here are close-up photos of the mechanism with the tab to the far left, center, and far right. I hope you enjoyed my card and hope that, if you have a Silhouette, you'll give one a try!